Abstract. In the X-ray diffraction analysis on the structure of metallic materials, an important place is determining packaging defects occurring in the planes of the face-centered cubic (CFC) crystal lattice or compact hexagonal lattice type. Cold working of metals with CFC crystal lattice type, and phase transformations such as martensitic transformation in steels, can induce such stacking faults on planes (111). In this paper we present a method for determining the concentration of residual austenite stacking failts for high alloyed steels M42 brand. Abstract. Multicompound Ni-Ti-X alloys are presenting, depending of chemical composition and alloying elements (Cu, Al, Fe, Zn, Co), some parameters modification of them main characteristic, the shape memory effect. So, one can observe, from thermal expansion curves of some alloys (Ni-Ti-X/T1*), solid state transformations in 800-900?C temperature range. This phenomenon leads us to the conclusion that one complex NixCuyTiz compound just “disappears” from that temperature. Abstract. This paper summarizes the results of the numerical applications at industrial level for the wear parameter and also shows its evolution under the influence of the main technological parameters. Abstract. Cobalt-ferrite nanocrystalline powder was obtained by chemical co-precipitation. Different samples were prepared by coatingcobalt-ferrite nanoparticles with an intrinsically conducting polypyrrole synthesized by a chemical route. The magnetic properties of cobalt-ferrite nanoparticles not changed significantly after encapsulation into polypyrrole shell. The electrical conductivity of the new hybrid nanomaterial obtained was measured by the four points probe method, and it shows a sudden increase in values to 42.4 S•cm-1 at 18 %wt. polypyrrole, that could be explained on percolation theory. New poly-functional material has been developed by combining the magnetic properties of cobalt-ferrite nanoparticles and the electrical conductivity of polypyrrole. Abstract. As it is know, the gauge blocks sizes should remain within a desired dimensional constancy in time. Many users have reported a change of the dimension of the hardened and aged gauge steel blocks. This dimensional instability has been report as shrinkage, growth or as change from one to the other at different times of measurement. Dimensional stability is a prime requirement for gage blocks, and stability could be affect by the structure and stresses within materials. The used steels have a metastable structure, which has a tendency to martensite transformation with an expected reduction in volume effect. After tempering operations, the phases are also metastable and can transform into bainite upon ageing at room temperature with an increasing effect. Residual stresses can induce in the gauge blocks at room temperature, a growth or shrinkage depending on the sign and orientation of the stress. Several other characteristics and properties are necessary in addition to dimensional stability: a high degree of surface finishing; flatness of surfaces; a parallelism of opposite faces for precise measurements, characteristics that are related to the surface hardness and structure. The coefficient of thermal expansion should be equal to those of high carbon steel. The materials with zero or very low coefficients are the best. Accuracy temperature control is essential and both gauge block and the measured piece must to come to the same temperature. Abstract. The aim of this paper is measurement of mechanical characteristics of CoCrMo parts. These are components of mechatronic assemblies, and were manufactured by using selective laser sintering technology. Our work follow two main objectives: manufacture of sample parts and associated mechanical tests in order to measure the material characteristics. Even if the materials produced by selective laser sintering are structural anisotropic, the experimental data within the same type of test had a relative low scattering. Abstract. The nanosystems based on metallo-porphyrins have an increasing interest in fields extending from chemistry and biology. The investigations of metallo-porphyrins in micelles in non-aqueous solvents can provide significant informations relevant to enzymatic and cell membrane interactions, organic and inorganic reaction mechanisms. Triton X-100 has been widely used as a non-ionic surfactant for porphyrin-drugs solubilizing and stabilizing in solution. The non-polar environment of Triton X-100 micellar may be used to incorporate hydrophobic porphyrin molecules, due to ability of metallo-porphyrins to penetrate into micelles yielding to strong polar cavity of these micelles, and to decreasing of the photodegradation rate reaction in micellar medium, attributed to deep penetration of metallo-porphyrins into the micelles with the polar group OH oriented toward to the micelle surface. The present paper is deals with the absorption UV-Vis and fluorescence variation spectra of some porphyrins from TPP and TNP free bases and their metallic complexes with Mg, Zn, Cd during the photodegradation process. Abstract. The installations for drying and heating the ladles are, mainly, installations with vertical setting of the ladle made up of a burner set on an arm for support and handling and of an installation for automatic operation of the process. Recently, a lid was added to this type of installations that is set on the ladle, the exhaust of the burnt gases being made through the room between the lid and the ladle or through holes in the lid. In order to recover the energy contained by the gases when exhausted from the ladle there have been produced recovery burners mounted on the lid of the ladle, set in vertical position, and installations with ladles set in horizontal position endowed with heat recovery devices. The installations for drying and heating the ladles set in horizontal position present the disadvantage of additional handling when setting the ladle and after preheating the takeover and the disadvantage of a not uniform heating. The paper presents an analysis of those performing solutions and installations for drying and heating the ladles together with the main technical characteristics. It also presents the results obtained on an installation for drying and heating the ladles vertically set at high temperatures, installation endowed with heat recovery device. Abstract. Mass and heat transfer in the continuous cast are the key concepts of the processes in progress at the cooling of the partially solidified yarn. Thus, here are reported issues related to mass and heat transfer at the solidification of the continuously casted product. Abstract. One of the most common stainless steel grade for high tensile strength products is AISI series 301 and AISI 304 (hardened state recently requests). Each steel producer is knowing the behaiviour of the materials using diagrams for programming the products. To have a good results is strongly required to keep the specific processes under low level of variation. Time to time is recommended to make an up-date of the diagrams using hystorical data. Abstract. 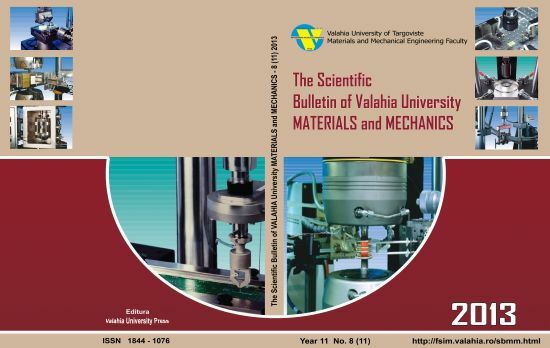 This paper presents a new type of air preheater radiation PAR-MD equipping room type heating furnaces metal materials industry increased efficiency with which a forging furnace found in equipment, thermo technological Laboratory Aggregates " within FIMMR - Valahia University of Targoviste. Preheater radiation PAR-MD is basically a combination of a preheater radiation fins arranged in a spiral metal and radiation type preheater kiln clepsydra. Equipped forge this type of air preheater radiation resulted in decreasing heating time of the blank and emissions. Abstract. Macroheterocyclic compounds, such as metal porphyrins have unique physical and chemical properties. New possibilities of the functional use of porphyrin and phthalocyanine compounds have been revealed recently, their capability for self-organization (self-assembly) can form a basis for nanotechnologies. Some supramolecular aggregates has been investigated in this paper using TGA/DTG. Thermogravimetry (TG) have been used to examin the thermochemistry, to study the thermal stability and thermal decomposition of a wide set of complexes of porphyrins and phthalocyanines. The composition of these compounds were determined from the TGA curves and confirmed by carbon, nitrogen, sulphur and hydrogen micro-analytical determinations. The current study focuses on characterizing the new nanomaterial system using dynamic light scattering (DLS). Observations of material-specific surface properties were also recorded. Additionally, a stock solution of nanomaterials was analyzed for changes in agglomeration and zeta potential of the material over time. In summary, our results demonstrate that the nanomaterials agglomerate in solution and that depending upon the solution particle agglomeration is either agitated or mitigated. It was also observed that sonication slightly reduces agglomeration and has minimal effect on particle surface charge. Finally, the stock solution experienced significant changes in particle agglomeration and surface charge over time. Abstract. The paper presents the steps and parameters of technological process of physical processing of the used batteries components, containing Zn and Mn. By the resulting products of the mechanical processing one can obtain electrolytic Zn and electrolytic MnO2 using electrolysis of aqueous solutions from reductive acid leaching with H2SO4 and H2O2, of the pastes obtained. The resulting products may be sold or reused in the process of obtaining batteries. Abstract. Aim of the study was to obtain and analyze thin layers obtained polymer matrix composite materials. Polymer matrix used in this research was siloxane rubber. The goal of present paper consits in the realization and analisis a composit material with polymeric matrix. The synthetic polymeric matrix used at the obtaining composite is represented by a bicomponent silicone elastomer that strengthens itself at the room temperature by means of a poly condensation reaction. Introducing the dust in the polymeric matrix is a simple technology of introducing the particles in the matrix, an ecological technique and without an impact over the environment, contributing to its conservation to obtain the properties of screening adjusted to the proposed goals. There was thus obtained thin films which have been subject to testing. They made such tests optical microscopy, x-ray diffraction and attenuation measurement for materials obtained.Electromagnetic radiation protection concerns mainly: low electromagnetic interference from electronic and communication systems and biological protection, protection that can be achieved with these screens developed in this research. Abstract. Thin film technology and, in particular, plasma deposition for the surface modification of conventional materials is gaining increasing popularity because it allows the design of new devices with unique surface properties. The main purpose of this study is to present equipments used for SiOx layer deposition by PECVD, especially on substrates as Ti and its alloys and to analyze by EDS different plasma chemical compositions. Abstract. Hydroxyapatite is one of the most widely used ceramic biomaterials in medical applications. This is due to the similarity in terms of chemical structures with mineal structures from the body tissue (teeth and bone). In this paper experimental results are presented in case of hydroxyapatite powders synthesized by chemical coprecipitation, after applying a heat treatment at low temperature. X-ray diffraction, Fourier transform infrared spectroscopy, particle size distribution analysis, as well as the morphology of the powders - all these investigations have revealed the synthesis of a material with appropriate characteristics clinical applications that might serve later. Abstract. This study proposes a strictly mathematical solution for the mathematical model which considers the convection at the liquid-solid interface in the steel continuous casting solidification process. The obtained solutions consist of calculation relations of: the thickness of the solidified crust, the temperature distribution in the solid fraction and the convection ratio at the liquid-solid interface. Abstract. This paper intends to post a cinematic element Bernoulli – Euler plane moving with constant section, to obtain mathematical model displacements, which are random variables with known statistical characteristics (mathematical expectation, dispersion, correlation function) and to determine the statistical characteristics of the dynamic response. Abstract. In this paper, it is considered linear elastic vibration rod (bar Bernoulli-Euler) with concentrated mass M discrete points of a mechanism R (RRR) with random excitation by the unknown. The mathematical models achieved vary over time, with weightings given random function of time and thus directly obtain the statistical parameters of the dynamic response. Abstract. In this paper we will present a new technology of rapid prototyping through selective laser sintering. We will use CT scans from patient on which we will execute a remodelling for obtaining customised implants. During the CT examination must took care of the chosen program for the study area was chosen so that the patient is not further irradiated. It is mandatory to comply with radiation protection for patients and staff occupationally exposed. Abstract. In different areas in the manufacturing processes the optimization is an important component by allowing the choice and application of economic and technological optimal solution leading to more efficient systems and decreased manufacturing costs and increase of productivity. Prioritizing characteristics the optimization can be achieved both in economic terms and in mechanical terms by limiting the current needs of the production flow of the system and in the same time it is necessary to know the parts that makes the machine systems to achieve efficient optimization with the desired effect. Efficient use of energy, the speed optimization work, and the system adaptation for a better accuracy and repeatability, etc, can mean the machine optimization for a better use. Mechatronic systems generally aim to maximize the optimization components from both technically and economically perspective, making use from reduced cost of execution and a maximization of operations that can be performed with this in a relatively short time. Mechatronic systems optimization can mean an improvement and increase efficiency of a machine which is integrated in the production flow so that the numbers of reported rejected parts to be significantly lower. Abstract. This paper presents an innovative device that allows manipulation of biological or micromechanical samples in dimensional range [10 ÷ 100] µm. Accuracy of movement / positioning is submicrometer. The principle is based on a hybrid drive, a combination of the electro-magnetic and piezoelectric forming a microgripper with two arms, each of two degrees of freedom. The in-plane microgripper actuation (tightening direction) is generated in a magnetic field, the movement being governed by compliant joints. The second degree of freedom is based on the piezoelectric effect, yielding the second bending movement in a vertical, transverse direction with respect to the former, magnetically-determined, direction of movement. Abstract. By experimental measurements, the paper aims to test the functioning of the dynamic type pillow during loading and unloading cycles and the ability to support various weight categories. By successive feeds pressure of 3 bar and 4 bar and with a sample weight load of 10 kg up to 70 kg, the influence of the loads on the elasticity of the pneumatic muscles is achieved and by the interface pressure values achieved between the user and the device. After using the device dynamically the air consumption is optimizes itself in terms of ergonomics, user weighing 60 kg, 80 kg, 100 kg. Through experimental research examining whether progressively increasing pressure device provides the ability to determine superficial skin massage with a role to oxygenate tissues, stimulate blood circulation and ventilation to the pelvic area between the user and the device. Abstract. The paper specifies the temperatures developed between the layers of a composite, subjected to a thermal flux and interior temperature of the wall (plane, tubular, or spherical) with known values. It is envisaged an intimate or defective contact between the component layers. The transfer is considered manifested by convection and conduction. The established expressions can harness set in the case of other laminated structures, too, with materials of different natures, supported as needed. Abstract. The paper presents aspects regarding the achievement of the virtual model and the experimental model of a mechatronic system for positioning and micro-positioning, designed to be integrated into applications of precision positioning for measurement, characterization of surfaces in complex vector space and temperature, inductive displacement sensors calibration, etc. Abstract. In this paper the process of obtaining nanofluids with 0.1%, 0.5% and 1% concentration of aluminium oxide (Al2O3) was studied by mechanical stirring, vibrations and magnetic stirring. The samples extracted during the process were analyzed with the quartz crystal microbalance (QCM), in terms of homogenization and stability. Also, a thermal transfer study with the reactor station and a comparison between the thermal transfer of the carrier fluid (consisting of water and 5.4% glycerin) and the heat transfer of the antifreeze used in solar panels installations was conducted. This study showed a decrease of the time consumed with heating the nanofluids and an improvement of the thermal transfer due to the nanoparticles of Al2O3. Abstract. The most relevant way to present how the deposits made through the Magnetron method, improved the knives efficiency, is to follow through experimental researches, the processing cutting length. The knives reach a certain value of wear, because in the industrial processes is considered a knife is used, when the quality of machined surfaces and edges decreases. Cracks and stone chips, for the ennobled panels of PAL and MDF, or tears and snatching of material for the wood products, through the experimental research, are observed. Abstract. The sectional forces diagrams in polar coordinates for circular beams can be plotted using the step-function available in MATHCAD (2011). The suggested method has the advantage of allowing a fast identification of the critical sections subjected to bending and the position of concentrated loads. The step-function ? allows an uniform and consistent expression and representation of the functions of the sectional forces in polar coordinates. This present paper deals with the method of determination of the analytical functions. Two particular examples for the determination of sectional forces diagrams for circular cantilevers under radial loading will also be shown. Abstract. The sectional forces diagrams in polar coordinates for circular beams can be plotted using the step-function available in MATHCAD (2011). The suggested method has the advantage of allowing a fast identification of the critical sections subjected to bending and the position of concentrated loads. The step-function ? allows an uniform and consistent expression and representation of the functions of the sectional forces in polar coordinates. This present paper deals with the method of determination of the analytical functions. Two particular examples for the determination of sectional forces diagrams for circular cantilevers under tangential loading will also be shown. Abstract. One of the basic functions of the human body is mobility. When the mobile function can no longer be performed, a number of problems arise. Orthopaedic implants are medical devices made of one or more biocompatible materials that are placed inside the human body in order to replace the damaged parts and take over their biological functions. The purpose of this paper is to present a series of analyses on two bipolar prosthetic components made of high-density polyethylene recovered after revision surgery. Abstract. This paper presents a solution for the checking of the jet-fun’s fire performance providing in closed car parks. We propose for this to use the Pyrosim program. The main goal of the simulation is to reveal the temperatures recording in three points under ceiling of closed car park, where the jet – funs are placed. Abstract. The high capacity Komatsu bulldozers have very performant equipments with Sigmadozer blade and a K bogie chassis for the moving system. For these components the proposed computing schemes realize the dynamic modelling of the bogie system adapting itself to the road profile enhancing the traction power and the adhesion growing. The computing models for the moving system together with the given examples and graphs, underline the working performances of the technical solutions belonging to the high capacity Komatsu bulldozers, that means a better stability, greater performance and a low fuel consumption. Abstract. The paper presents a numerical method used to analyze the dynamics of a mechanical system that presents two inner links namely: one elastic link by a non- linear spring and one link by made with the help of a gearing. The whole system has two degrees of freedom. Abstract. The paper presents a numerical method used to analyze the dynamics of a mechanical system that presents three inner links namely: two elastic links by linear springs and one link by rigid rod of negligible mass. The whole system has three degrees of freedom. Abstract. Three-dimensional scanning is available for more than 15 years, however there are few that have heard of it and as few people know the applications of this technology. 3D scanning is also known as 3D digitizing, the name coming from the fact that this is a process that uses a contact or non-contact digitizing probe to capture the objects form and recreate them in a virtual workspace through a very dense network of points (xyz) as a 3D graph representation. Most automotive manufacturers currently use 3D metrology based on optical or laser systems to validate products quality. The pieces are initially measured by 3D scanning then they are compared with the designed model (CAD file) using a specialized software. The overall accuracy of a 3D acquisition system depends above all on the sensor’s precision and on the acquisition device (acquisition with contact) or acquisition structure (acquisition without contact). This accuracy may vary from micron to millimetre and the acquisition’s size from a few points to several thousand points per second. In a perfect world or in an integrated production environment, 3D measuring systems should be able to measure all the necessary parameters in a single step without errors, and to render the results in the same way to the manufacturing networks equipped with computers, in formats useful for machines control and processes management.